A film by Clare Major. Feast & Sacrifice is a carefully observed portrait of a Senegalese family living on the ragged edges of globalization. Questions of work, gender, and aspirations emerge as the family prepares for the biggest holiday of the year, the Islamic Feast of the Sacrifice. Feast & Sacrifice follows the story of one Senegalese family, as they prepare for the Tabaski, the Islamic feast of the sacrifice. The filmmaker, Clare Major, served as a Peace Corps volunteer in Senegal for two years, and lived with the Bah family. Following her service, she returned to her village of Saare Muudu to capture the experiences of her Senegalese host family. 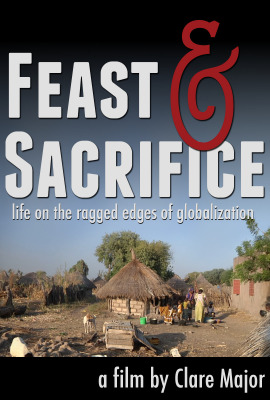 Feast & Sacrifice perfectly captures the struggles of rural communities in a rapidly globalizing world. The new opportunities available to families in rural Senegal bring with them a host of new problems and cultural stresses. New questions about old customs create strain between husbands and wives, children and parents. The story of Peace Corps volunteers is often told, but this film may be the most complete portrait of a Peace Corps host family. This film also contains a bonus educational commentary about Peace Corps Senegal and the filmmaking process. Feast & Sacrifice was one of nine national finalists in the 2011 Student Academy Awards documentary competition. From 2004 to 2006, I served as a Peace Corps sustainable agriculture volunteer in Senegal, West Africa, where I worked with farmers and my host village women’s group to improve crop production and generate income. Living for two years with the Bah family in Saare Muudu, I was intrigued by how the village existed at the intersection of First and Third Worlds. This film is an attempt to convey some of the stories of individuals—men working abroad, women left at home, and children confronting the divergent paths before them. A graduate of UT Austin’s Radio-TV-Film department and of the UC Berkeley Graduate School of Journalism’s documentary program, I have been working as a freelance filmmaker and videojournalist in the San Francisco Bay Area since 2007. From 2004 to 2006 I was a Peace Corps Sustainable Agriculture Extension Agent in Senegal. Feast & Sacrifice was my graduate thesis film at the Berkeley J-school. Posh Corps is a feature documentary film and media resource which focuses on the modern Peace Corps experience. Real volunteers discuss the Peace Corps experience as it happens. Our films and videos tell the stories of volunteers in South Africa, West Africa, Eastern Europe, Asia, and the Americas. This production is not affiliated with the US Peace Corps or the US Government. The statements and opinions expressed herein are solely those of the individual speakers and do not constitute official statements or positions of the US Peace Corps, the US Government. The US Peace Corps has not approved, endorsed, or authorized this production or the use of the Peace Corps logo. All materials ©2013-2016 Alan Toth, unless otherwise noted.